One hundred years ago today, people all over the Boston area stopped what they were doing to celebrate the end of the War to End All Wars. 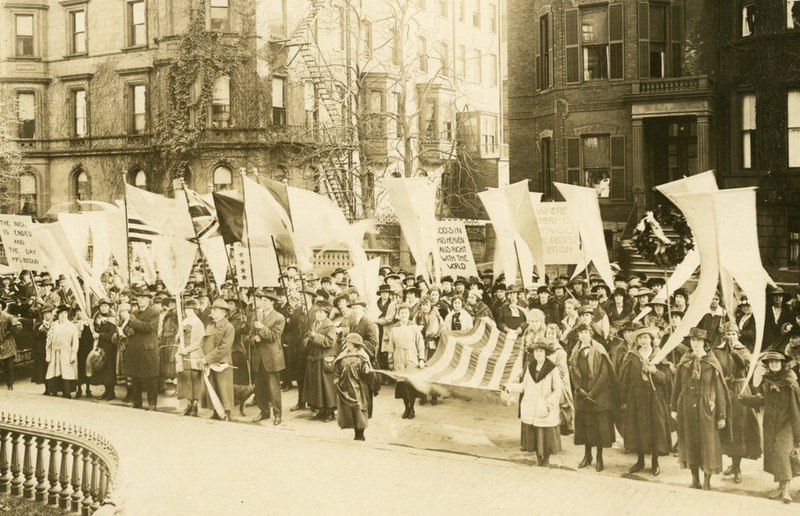 The Massachusetts College of Art and Design has a photo of a celebratory march in the Back Bay. Michael J. Perkins of South Boston and all of the fallen, who are forever young. I do love the photo of the truck carrying passengers. It reminds me of the MBTA bus shuttle I will have to ride to observe veterans day in Boston. Your troubles are literally just as serious as those who were remembered yesterday. Maybe we should consider you a vet as well since you've survived so many commutes. I'm glad it wasn't raining. Although back then presidents weren't vain TV reality stars who would cancel a celebration to honor our country's war heroes over a couple rain drops. Is that Mass. Ave.? Charlesgate? I have no idea; does anyone know? House on the right is #2. The Normal Art School (predecessor to Mass College of Art) was located on Exeter St. between Comm and Newbury. Since it's from their archives I'm guessing it's somewhere around there. Seems to be an alley splitting the frame.